ALLENDALE – Ramsey’s boys basketball team has size, not the ‘Big for a Group 2 team’ type size, but the kind that makes for mismatches all over the court no matter who the public school opponent is. Senior Sean Hansen is listed at 6-foot-9. Senior Kevin Foelsch is listed at 6-foot-4. Junior Steven Turk is listed at 6-foot-5 and senior Owen Korz is listed at 6-foot-2. Throw in point guard Jaden Quinerly, a junior six-footer, and the Rams can present some problems especially when the retreat into their active 2-3 zone on the defensive end. After a nearly even first quarter in the Round of 16 of the Bergen County Jamboree on Saturday at Northern Highlands High School, Ramsey’s superior size and strength wore down another opponent, this time it was Group 4 Fair Lawn. The Rams won the second quarter by a whopping 20-4 margin and the game by a 58-41 final that puts Ramsey into Sunday’s quarterfinal round where it will get a shot at second-seeded Bergen Catholic at Fairleigh Dickinson University. Edwin Muniz tied for team-high honors with 11 points for Fair Lawn. The first quarter had shootout written all over it as two of Bergen County’s best public school teams went back and forth. Ramsey led the whole way after Korz opened the game’s scoring with a three-pointer, but Fair Lawn stayed with one or two possessions through the entire first quarter and for the first half of the second. 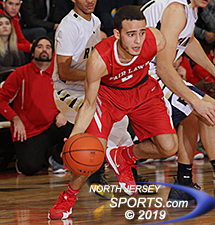 Fair Lawn trailed 15-12 after the first period and was within five points, 21-16, with 5:46 left in the opening half after Edwin Muniz scored on the fast break. The Cutters were finding ways to make up for the last minute loss of Or Sundjevsky, the 6-foot-4 junior who tweaked his ankle in the waning minutes of Friday’s practice and was not ruled out of the game until just about a half-hour before tip-off on Saturday. The game changed for good with 5:16 left in the second quarter when Turk buried a three-pointer to kick off a 14-0 half-closing run that took Ramsey from a five-point lead to a 33-16 cushion and it led 35-21 at the intermission. Ramsey never let Fair Lawn get back inside double digits in the second half and Hansen was the difference maker. He compiled a game-high 30 points for the Rams, which improved to 16-1 on the season. 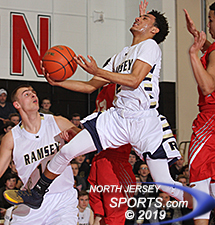 Junior point guard Jaden Quinerly scored all 14 of his points in the first half for Ramsey, which will play second-seeded Bergen Catholic in the quarterfinals. barnstormed their way into the quarterfinals, which are evenly split between four public schools and four non-publics. It will be public vs. non-public in all four games next Sunday at the Rothman Center and Ramsey has an obviously tough assignment against second-seeded Bergen Catholic, which brings its own impressive size to the party with the 6-foot-8 tandem of senior Zach Freemantle and junior Matt Zona. McGuire is looking forward to the opportunity and the challenge. John Burek and Muniz led Fair Lawn with 11 points each and Darius Sohikish finished with 8 for the Cutters who, despite the Round of 16 exit, have plenty of opportunities left to make this a special season.